Turkish one of the most popular beverage is boza. It is thick, sweet-sour drink. Very delicious drink. Boza made of millet, wheat, corn, rice or barley. 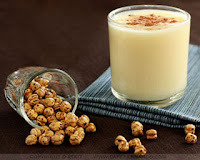 It is a seasonal beverage, drunk in the winter.You should taste it when you see Boza in Turkey.